For over a century, five companies ran the London Gold Market Fixing Company and set prices through a process conducted by telephone called the “London Gold Fix.” 1 On March 20, 2015, the ICE Benchmark Administration (IBA) took over and replaced the process with an electronic auction system called the LBMA Gold Price. 2 3 The LBMA owns the rights to the process. Several banks, an oversight committee, and a panel of internal and external chair members make up the IBA. 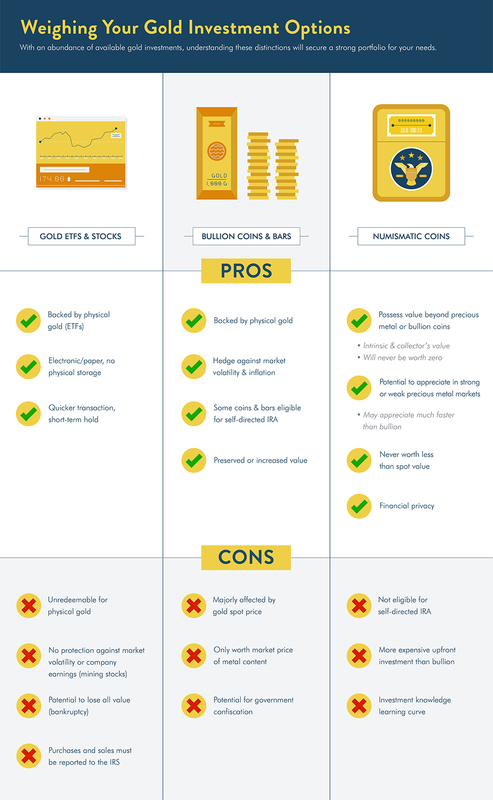 Traders primarily use two pricing models to estimate the potential investment value of gold. Gold futures prices serve as the basis for the LBMA Gold Price. These are contracts for the physical delivery of a specified amount of gold on a set date in the future. Multiple factors determine the price of a gold futures contract: the spot price of gold; the predicted changes in supply of and demand for the precious metal; the estimated cost of transporting and storing the physical gold; and the risk-free rate of return for the holder of the gold. Since the physical gold is not immediately delivered upon purchase, these trades are primarily electronic. They’re also highly risky because of the unpredictable nature of supply and demand factors. The COMEX is the world’s largest gold futures trading exchange. Gold and other precious metals are also traded there. Do Other Factors Influence Gold Prices? What affects gold prices other than the LBMA pricing process? Three main external factors have a significant influence on the price of gold. The basic economic principle of supply and demand is a major influencer of all commodity prices. When gold demand is high and supplies of the precious metal are low, gold prices will rise. In the opposite scenario of high supply and low demand, prices decrease. Since gold is finite, supplies will always be limited. By some analysts’ measure, the world reached peak gold years ago, so production levels will only continue to decline. Gold demand from investors, central banks, and the medical and technology sectors, however, remains strong. Political and economic events shape market conditions, which in turn influence gold prices. As former Federal Reserve Chairman Ben Bernanke said during the Great Recession, gold prices reflect a nation’s economic health. During that time, gold prices soared, reaching a record high of $1,917.90 an ounce in August 2011. 6 In recent years, political and economic turmoil in Europe has also fueled the purchasing of safe haven assets like gold. Currency depreciation occurs when a country’s currency loses value in relation to one or more foreign currencies. Inflation and monetary policy, such as quantitative easing, are two causes of currency depreciation. 7 Inflation is essentially the decrease in purchasing power of a currency over time. For example, between 2005 and 2015, the purchasing power of the dollar decreased by 20 percent. During this time, gold prices increased by over 169 percent. Since gold tends to maintain or appreciate its value and currency is subject to significant losses in purchasing power, investors protect their portfolios with gold. When a nation’s currency is weak, investors turn to gold, increasing demand and prices. Similar to gold prices, several factors influence the value of the various gold products. It’s important to evaluative the pros and cons of each type before investing. When you buy bullion, you take possession of the physical gold. In many cases, investors store their bullion in precious metals depositories. That gold will also hold value or appreciate in value, unlike paper currencies, which can quickly depreciate during times of inflation or market volatility. Investors can also use gold bullion to protect their retirement, as some coins and bars are eligible for a self-directed IRA. Changes in the gold spot price affect the value of gold bullion, which will always be worth the market price for its metal content. There is a chance the government could confiscate investors’ gold bullion. In addition to being worth their weight in gold, numismatic coins are also valuable for their history, rarity, and an array of other factors. Collectors enjoy the hunt for especially rare coins, as well as learning about each coin’s unique history. Investors can benefit from substantial increases in the value of their numismatic coins. Numismatic coins have two sets of factors impacting their price: those of the precious metals market and those of the collectors’ market. When the precious metals market experiences a dip, numismatic coins could still shine due to collector demand or auction timing. Investors and collectors also enjoy financial privacy when they purchase these coins. Collecting numismatic coins requires knowledge of the market and, sometimes, a larger upfront investment than purchasing gold bullion. However, most gold firms offer education and assistance with the process. These coins are not eligible for a self-directed IRA. Gold ETFs are backed by physical gold, but, since they’re electronically traded, the investor does not have to secure and pay for gold storage. Transactions are also quicker than those in which large sums of physical gold must be delivered upon purchase. Shareholders indirectly own the physical gold in the fund, so they can’t redeem it. Often mining companies own the fund, so ETF holders are subject to the impact of market volatility on the company. Investors risk losing everything and going bankrupt. Gold ETFs must be reported to the IRS, so holders have less privacy than if they purchased physical gold. Knowing how the gold market works and what determines gold prices can help one invest wisely in the precious metal. Long-term investors can spot opportunities to purchase gold and to profit from their holdings of the yellow metal. However, no matter how much prices fluctuate, they understand that gold will always hold value in their portfolios.